We have one goal in mind from design to manufacture of each CNC lathe: to make a turning center that helps our customers increase profitability. With this single objective, our team determines the best design strategy, develops software features for our integrated control powered by WinMax, and collaborates with the top manufacturers of premium components. No control gets you from print to part faster. Which Lathe Is Right for You? The general purpose TM or high performance TMX. Designed to keep high mix shops competitive. Our customers’ praise is our greatest advertisement. The Hurco CNC control allows you to choose the best method of programming for each individual job—our powerful conversational programming or industry standard NC. You design the part and choose the most efficient way to program it. The control’s touch-screen console displays verification graphics that use color graphics to show the actual tool paths and stock removal. Since you can see the cuts on the screen before they are executed, you can virtually eliminate material waste and potential machine crashes. When you check the program for errors, you can use Data Block Search to go directly to the data block containing the error and edit the program. Hurco engineers have made sure the lathe control meets the specific needs of turning. For example, when using bar stock, you can separate your completed part from the bar by using a cutoff block. If you have added the parts catcher to your lathe, you can choose to advance the catcher when the tool passes your programmed X-axis position. The threading cycle performs multi-pass threading for outside diameter (OD) and inside diameter (ID) threads, including angled pipe threading. The control simplifies threading—you can easily set roughing passes, spring passes, decreasing depths, and multiple starts found in complex threads on one screen. All Hurco turning centers are built for increased rigidity with an extra wide saddle and large Z-axis rails. Our engineers apply the same attention to detail when designing the TM and TMX lathes they use when designing our mills. They know how to maximize rigidity due to their mechanical design expertise and rigorous analysis testing processes. Ergonomic design features make each process more efficient. Convenient front access to chuck and tailstock pressure controls. Front loading coolant tank and chip conveyor design to minimize maintenance. The 30-degree true slant bed design promotes larger turning capacity in addition to efficient chip removal. Component isolation system minimizes heat dissipation and protects the spindle head to combat spindle growth. Advanced spindle technology with high output spindle motor. Additionally, the spindle motor is strategically designed for easy access, easy maintenance, and to minimize the length of the belt. The turret features fast index speeds and rigid design. Which CNC Lathe Is Right for You? While there are differences in the TM general purpose lathes and the TMX high performance lathes, we approach the design of both types with the same rigorous attention to detail. 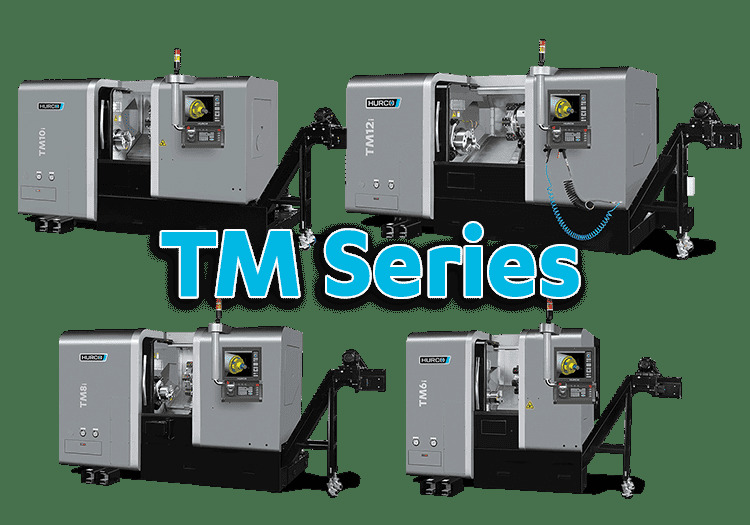 For example, both the TM and TMX turning centers are designed with a 30-degree true slant-bed that supports larger part capacity and rigidity, and promotes easier chip removal. The TM general purpose lathes range in chuck sizes from six inches to 18 inches with the smaller TM6, TM8, and TM10 offering a turret index time of .5 seconds and rapids of 750 in X and 945 in Y. With a generous through-hole, the TM Series of lathes has all of the functionality required for broad-based applications. The TMX turning centers have all the power needed when high performance is required—increased rigidity due to a frame designed with extra wide saddles and large Z-axis rails, increased travels, faster spindle acceleration rates, more horsepower, and faster rapids. The most challenging business proposition for shops these days is figuring out how to stay competitive when you produce a high mix of parts in smaller batches. With the advent of Just In Time (JIT), your customers continually want to minimize inventory, which means they rely on you to make the parts as they need them. It’s our job to make lathes that help you stay profitable while exceeding your customers’ expectations. In addition to reliability and rigidity, a Hurco lathe offers plug and play extras that increase productivity. WinMax Control: Powered by WinMax, the lathe control has numerous features to enhance productivity, such as AutoCalc, Auto Tool Nose Radius Compensation, DXF Transfer, Data Block Search, and Advanced Verification Graphics that illustrate tool path, tool rapid moves, and the tool path with selected tool insert. Tool Presetter: A compact and robust tool setting probe that uses a stylus touch application for accurate measurement of tool geometry offsets . Easy Chip Management: The flood coolant system ensures that coolant is delivered to the tool station in use. You can control the coolant direction with adjustable coolant nozzles mounted on the tool turret. For the most efficient chip cleanup, you can add a chip conveyor. In the consumer electronics market, Apple has become the envy of companies in that space. Price erosion, commoditization, etc., have led many to struggle and others to fold. Apple made a strategic decision to focus on its core competencies: usability, sleek design, research & development…and lots of marketing! They don’t manufacture their products. They leave that to companies that have decided manufacturing is their core competency. In the machine tool world, we had a similar realization as our company went through a growth spurt. We needed to focus on our core competencies. 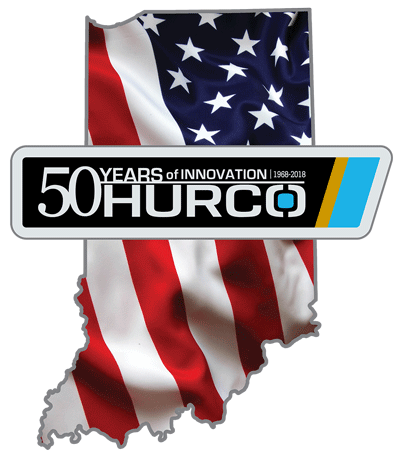 Like Apple, we are a U.S. company that is traded on the stock exchange (HURC). Like Apple, we conduct all engineering, product development, and R & D in the USA. Like Apple, we collaborate with key partners in our industry from design concept through manufacturing. We don’t simply source components, we partner with organizations that are the best at what they do—like Yaskawa, a leader in motion control, and the highly regarded Bosch Rexroth. Unlike Apple, we don’t outsource our manufacturing because we’re not talking about gadgets and music players—we’re talking about capital equipment that our customers rely on for their livelihoods. Therefore, we conduct all manufacturing at our wholly owned subsidiaries throughout Asia because we need complete control. From a strategic standpoint, manufacturing overseas makes sense because 90% of the machine tool market is outside of North America. This strategy benefits our customers because we are able to ship our machine tools with shorter lead times than most competitors. Our corporate agility promotes financial stability, which means we are able to continue developing control technology and mills, lathes, and mill turn machines even during the worst of economic conditions. Additionally, our focus on minimizing non-product expenses, makes it feasible for us to equip our turning centers with premium components. "Using the new Hurco TM8, Lanese Tool saved a grand total of 33 hours on one job."